When you have a health issue, you want the most advanced technology available to help your doctor reach a diagnosis fast. At his clinic in Encinitas, California, Dr. Keven Tagdiri conveniently offers in-house procedures in a caring environment, including a wide range of ultrasound techniques. To find the highest quality medical care with on-site diagnostic tools like ultrasounds, call Keven Tagdiri, MD, or schedule an appointment online today. Ultrasounds use high-frequency sound waves to produce images of the inside of your body. The images ultrasounds create are called sonograms, and ultrasounds are also known as sonography. Most ultrasound technology uses sound waves between 2-18 megahertz (MHz). As the sound waves travel through your soft tissues and fluids, they bounce off denser surfaces to create an image. Lower-frequency sound waves penetrate deep inside your body but create images of poorer quality. Ultrasounds using higher frequencies capture higher quality images, but can’t penetrate as deeply. Ultrasounds are safe because they don’t use radiation. They’re used to not only monitor pregnancies but as an invaluable tool for diagnosing health conditions. Dr. Tagdiri offers a wide range of ultrasound technology on-site. 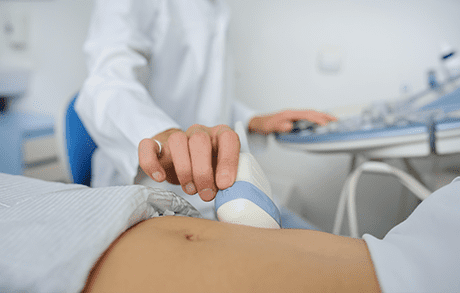 Each type of ultrasound uses a wand-like device called a transducer. During your ultrasound, Dr. Tagdiri presses the transducer against the area of your body where he’s capturing images. Dr. Tagdiri also offers diagnostic tests like electrocardiograms (EKGs), that measure the electrical efficiency of your heart. Dr. Tagdiri might recommend ultrasounds for diagnosing, treating, and guiding certain medical procedures. Because it’s a noninvasive tool, it enables him to examine internal organs, like your heart, pancreas, kidneys, liver, and thyroid glands, while also identifying issues in the ovaries or testes. Dr. Tagdiri might also use an ultrasound to diagnose whether a lump is a fluid-filled cyst or tumor. To learn more about ultrasound technology, call Keven Tagdiri, MD, or schedule an appointment online today.